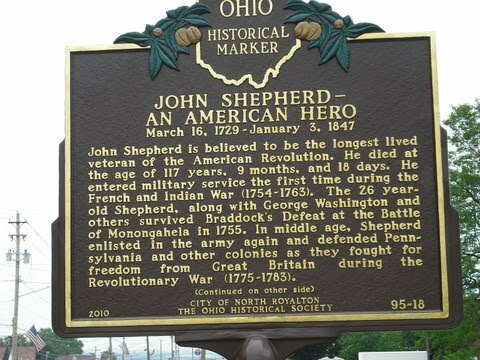 On Saturday, June 26, my husband and I drove to North Royalton, Ohio for a parade and memorial service to my ancestor John Shepherd. John was born in 1729 in Philadelphia, Pennsylvania. He served in the French and Indian War and the Revolutionary War. He moved to central Pennsylvania, then New York, and finally to Ohio. He died in North Royalton in 1842. Reaching the age of 117 years. Now I'm not exactly a believer in all that is credited to John Shepherd. Maybe he really did live all those years. But was he really in all the battles that he said he was? Did he really serve with George Washington? Why was his pension denied if he was telling the truth? But despite all that, I decided that I had to be a part of his memorial day. The day started with a free pancake breakfast sponsored by the city. Then I got to ring the traveling Liberty Bell. 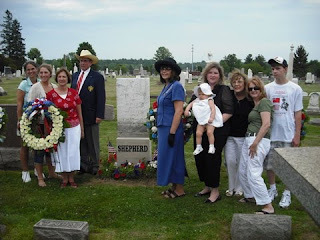 We visited John Shepherd's grave before the service. A new base was recently installed. Then it was time for the parade. Then a wonderful memorial service. The keynote speaker was Lt. General Robert W. Wagner, United States Army, retired. 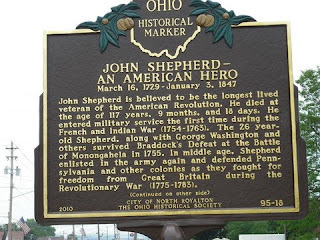 An Ohio historical marker was unveiled. The best part of the memorial was meeting and talking to distant cousins. You can read more about the memorial here and find out more about John Shepherd here. Sounds like a nice day. I must say, I thought, what 117 years old? Then I saw the marker, and it seems to be documented, so I'm a believer now. Hope you have those genes! Most impressive. You are close to me here in North Olmsted, Ohio. What an exciting day for you and your cousins. I'll have to take a day trip down to North Royalton to see the marker.